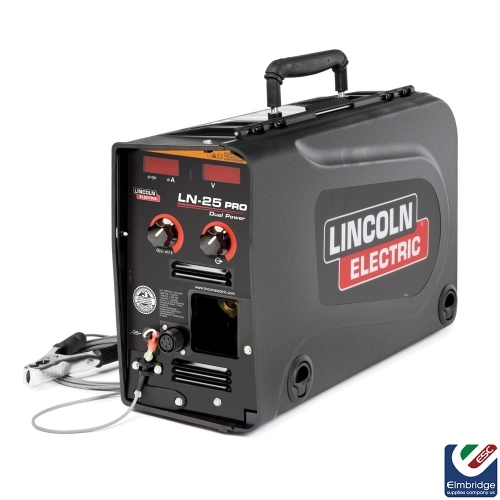 Built upon on tradition and success of the LN™-25, the new LN™-25 PRO Portable Industrial Wire Feeder is designed to be simple, reliable and easy to service. This machine is ideal for field construction and fabrication, shipyards and rental companies. The LN™-25 PRO, with its lightweight yet flame resistant polycarbonate case is portable, such as potted and trayed PCB boards are highly protective against moisture, corrosion and dust. Reliability is further enhanced via a reel locking mechanism which eliminates spindle cross-threading. A build in flow meter eliminates guess work when long gas hoses are used. A burn-back, pre-flow and post flow kit is also availability as an option. Maxtrac® Wire Drive System - Heavy-duty cast aluminum wire drive system provides reliable feeding and durability. Dual Range Wire Feed Speed - Delivers greater precision at low end wire feed speeds. 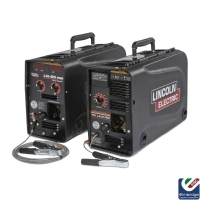 Trigger Interlock Switch - Provides operator comfort for long welds. Replaceable and Flame Resistant Case - Rugged and durable case can be replaced in less than five minutes. Potted PC Boards - For moisture and corrosion protection.